She is named for her grandmother. [S223] Unknown subject unknown repository. [S224] Unknown subject unknown repository. Note* � He It is interesting that a cemetery record (name unknown) gives the following conflicting information: Charley Bryant born 11-7-1878 died 12-29-1878 "Son of Joel and Mrs. Amanda Bryant" Then later the same record records Jerdin Turner born 10-1-1864 died 11-1-1866 " Son of Joel Turner and Mrs. Amanda Bryant". This would work if dates were reversed, but as they stand it does not make sense. Possibly a check of the census records would shed light. [S61] 1920 Census;, Shown living with his parents. [S359] Unknown subject MVW file. 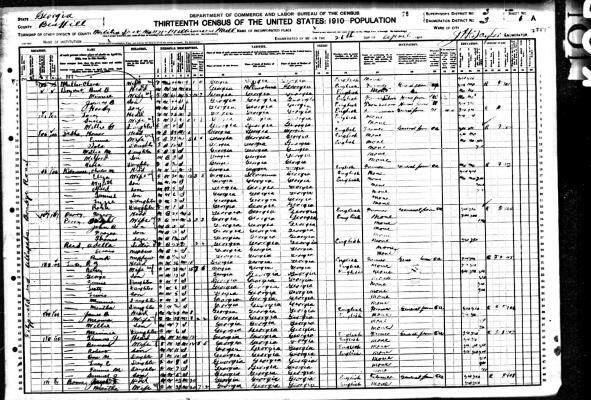 [S61] 1920 Census;, Shown living with parents. [S237] Unknown subject unknown repository. [S236] Unknown subject unknown repository. [S230] Unknown subject unknown repository. James Burrell Bryant was born 22 November 1840 in Pulaski County Georgia. He is the son of Thomas and Margaret Bryant. James married Winnifred Anderson, daughter of Joseph Anderson and Mary Tyson, about 1865 in Pulaski County after he returned from the war. James enlisted in Co. B, 14th Battalion, GA Light Artillery "Anderson's Battery" on 01 May 1861 at Camp Golgatha, Hawkinsville, Pulaski County Georgia, serving under Captain Ruel Anderson. His job was to drive a team of horses that pulled a battle cannon. He fought in Tennessee at the battles of Mufreesboro and Chattanooga; he fought in Georgia at Chickamauga, at Griswoldville and at the siege of Atlanta. He also fought in battles in the Carolinas. He was discharged 10 April 1865 in Greensboro, North Carolina. March/April 1863: Fairfield, Tennessee. "Moved since last muster from Tullahoma Tenn to Manchester, Tenn April 22, 1863 thence to Fairfield Tenn April 23, 1863." July/August 1863: Chattanooga, Tennessee. "Moved from Tenn Station to camp near [...]. Remained there until the 27 Aug 1863 then moved to [...] ford on Tenn River then remained guarding the ford until the 6th Sep & then march three days and arrived at McClambers cover where the enemy was driven back one [...] engaged no loss sustained then marched to La Fayatee one action coming up in the rear with rear Guard." Sept/Oct 1863: Chattanooga, Tennessee. "Moved from La Fayette on the 16 Sept to Battle Ground near Chickamauga River on the 19th the Battery moving with the Brigade but not itself engaged. Had one man mortally wounded since died. 3 horses killed on the 20 Sept Battery still moving with Brig. One Lieut killed 11 Sgts [...] & 5 privates slightly wounded -- 13 horses killed." Nov/Dec 1864: Coosawhatchie, South Carolina. "The Battery left Lovejoy Station on 15 Nov 1864 enroute to Macon, GA where it carried on the 18th went to Groswoldville on 22 Nov with [...] by Smiths Command where engaged the enemy four hours had one man killed one mortally and two severly wounded. Returned to Macon night of 22nd, left Macon 24 Nov and marched by land to Hawkinsville GA from thence came by steamboat [...] on the Altamaha thence to Savannah by railway on 5 Dec then remained on line of battle engaged in [...] with the enemy until night of 20 Dec. Had one [...] dismounted and several men slightly wounded in [...] at Savh. From Savh marched to Hardenville on night of 30 Dec and from thence to [...] in SC on 23 Dec 1864." (Confederate Army, Co. B, 14th Battn, GA Light Artillery, "Anderson's Battery"). According to James Burrell on his pension application, he was not with his unit when they surrendered at Greensboro, NC. He was "on furlow to see my people by permission from my Captain -- Anderson." Deed Book Y, page 590, Tattnall Co., Ga.
to the same with himself. J. A. Standfield, J.P. Zach Hall. Here is the family of Burwell living in Coffee County from which he filed for his military pension that required his sister, Liffie's affadavit. 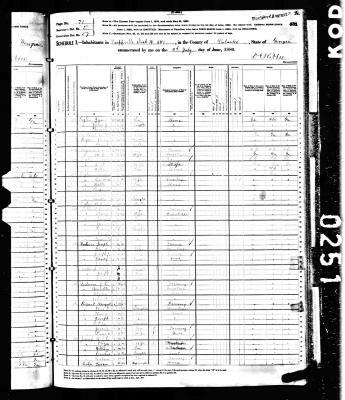 CENSUS1910* 1910� He appeared on the census in 1910 at Ben Hill County, GA. This family moved a lot. Left Pulaski and went to Tattnall in 1880 then to Coffee county in 1900 where he filed an indigent pension request in 1909. Finally ended up here. [S206] Unknown subject unknown repository. 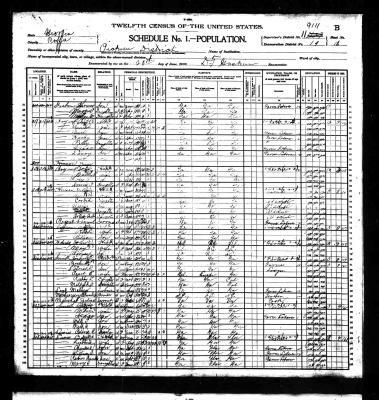 [S56] 1880 Census;, Year: 1880; Census Place: District 39, Tattnall, Georgia; Roll: T9_166; Family History Film: 1254166; Page: 425B; Enumeration District: 87; Image: 0496. [S59] 1900 Census;, Year: 1900; Census Place: Pickren, Coffee, Georgia; Roll: T623 189; Page: 18B; Enumeration District: 19. [S60] 1910 Census;, He is living at home with his parents and is listed as divorced. Jane E. is clearly shown here with her family. However, cannot find her in 1860. Occ: Home Fa: GA Mo: GA. Here is Orliffy (Artipy) living with her mother and older sister. 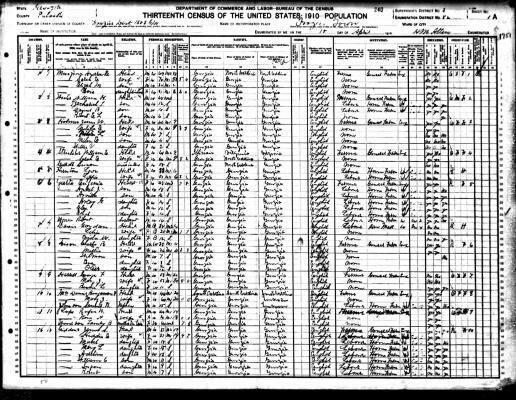 CENSUS1910* 1910� She cannot be found on the census in 1910 at GA; I have searched every which way, but cannot find her in the 1910 census. I am sure she was alive as Annette remembers seeing her when she was about seven years old (1925). I would have thought that she would continue to live with her sister Orliffy who married Charles Love Herndon in about 1901, but a search of the census finds Love and Liffie living in the small town of Frazier, but no trace of Jane. No sign of Jane on this page or anywhere in the community. Biography* 1999� Jane E. Bryant never married. According to Annette Floyd Vollmer (1977) she remained unmarried in order to help her mother care for all the children. Margaret Bryant, her mother was a widow before 1870 and with her own children plus what appears to be two adoptees(need to check this fact -mvw 09-01), Jesse and Joel, would have certainly have needed help. Annette Vollmer also remembers her mother, Annie J. Holland talking about "Aunt Jane" who would of course be Jane E. Bryant. The 1900 Pulaski County Census shows Jane E. Bryant who never married, living with her sister Arliffy. Arliffy is listed on the census as being divorced. Both from remembrances and the records it seems that Jane Bryant first helped her own mother raise a large family and then proceeded to help her younger sister, Orliffy Bryant Holland raise two children, Annie Jane and Juilliet Holland. 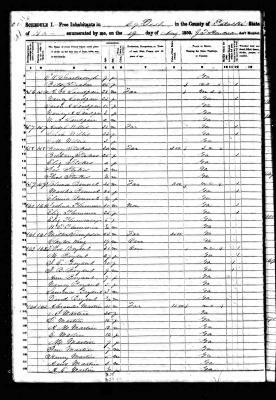 [S56] 1880 Census;, T9-0162 page 431A. [S572] Saralyn Ferris, "Saralyn Ferris," e-mail to MVW, Dec. 2005. [S204] Unknown subject unknown repository. [S205] Unknown subject unknown repository.